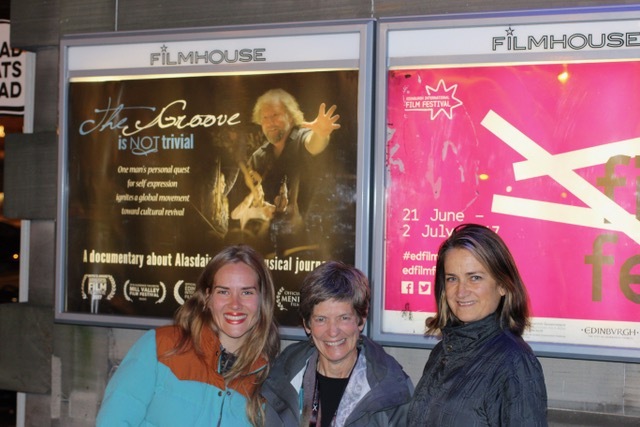 THE GROOVE IS NOT TRIVIAL made its International Premiere this summer at the 71st Edinburgh International Film Festival, the world’s oldest continuously running film festival. THE GROOVE was selected for the festival’s Documentary category from among thousands of submissions from around the world, and was chosen to be represented at the Festival’s presence at Cannes Film Festival in their Spotlight on Scotland. According to festival representatives, “The rise in popularity of documentary cinema has been a remarkable trend in recent years.” We are thrilled to have been invited to present THE GROOVE to Scotland at this prestigious event. Tommie and Kate were there for an emotional conversation following each of the two screenings. Editor Elizabeth Finlayson and son A.J., and architect Tyler Kobick, who designed our wonderful movie title and logo, came from California, and we were joined in Edinburgh by Alasdair Fraser’s sister Christine Yorston and brother Iain Fraser and wife Ruth, plus our good friend Carley Williams Leith.